It is important to take care of your car tires because it saves you money on fuel costs and helps extend the life of your tire, so you don’t have to purchase tires as often. But, you might ask about how you could actually take care of your car tires? You’re in luck because here are some steps that you could use to help you take care of your car tires better. It is common for people not to notice that their tires are damaged. You need to check your tires regularly and look for any wear or damage to your tires to avoid more significant problems to the rest of your car. You could purchase your own pressure gauge or use the pressure gauge from the local garage. It would be a good idea to check in the morning before you use your car because the tires heat up when you drive, and your reading might be affected when you check the pressure of your car tire after you use your vehicle. You could then unscrew a valve, found on each of the tires, and put your gauge on top of the valve. If you hear a hissing sound, don’t worry, because it’s brief and it’s normal. You could then see the pressure found on your gauge and you can compare it to the suggested bar, or psi, found in the owner’s manual for your vehicle. If you have a home compressor, you can use it to adjust the pressure of your tires. If not, you can fill your tires at your local garage. You can then re-check the pressure of your tires and see if it matches the specifications of the manufacturer. If it matches the specifications, you can then put back the valve caps of each tire. 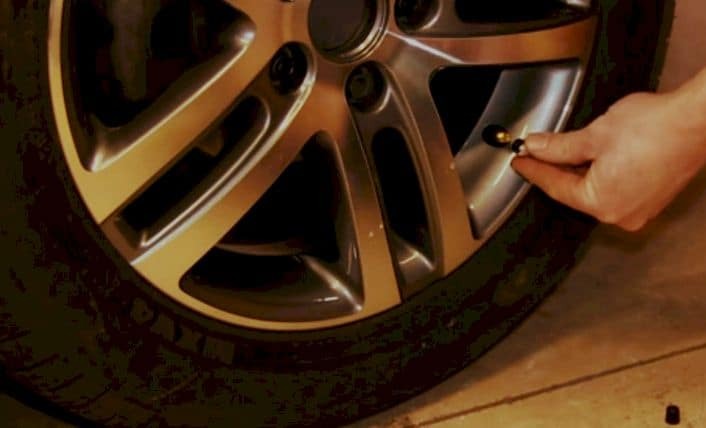 As a note, if there is an excessive drop in pressure, you need to ask your garage for help because your tire could have a slow leak, which is usually caused by a faulty valve or ill-fitting rims. Also, it would be a good idea to check the pressure of your tires on a monthly basis, or before you go on a long trip to avoid accidents. The tire load index chart states that you should not go beyond the load capacity when compared to the load index of your tire. When you load tires that exceed their maximum, it could cause a build-up of excessive heat that could result in the sudden destruction of your tire. If you schedule your regular car maintenance, it would be a good idea to get an alignment checkup. This is because any problems with your car’s alignment could wear down the tires of your car. So, if you ever experience a strange drifting, pulling, or gravitating towards the left, or right, side when driving, you need to get the alignment of your car checked to help you preserve your tires longer. You need to check the owner’s manual of your vehicle for any advice by the manufacturer. It’s suggested that the tire rotations follow the recommendation of the manufacturer. You should only rotate the tires front-to-back if all of the tires have same sizes. If you plan to rotate your tires using a directional tread pattern, you need to look at the arrows that are found on the sidewall because these arrows show the tire’s turning direction. Tires that have different sizes for the front and rear sections of your vehicle will need mounting, rebalancing, and dismounting to rotate the tires correctly. The state of the tread of your tires is one factor to determine the health of your vehicle. When you check your tires regularly, you might be able to see potential problems that would need the intervention of a professional. It would be wise to look at your tires once in a month, or before and after going on a long trip. So, what should you look for in your tires? Visible tread wear bars – Tread wear bars are made of hard rubber and designed to be seen if you have worn tire treads. If you’re unsure of where to look, there’s a mark found at the sidewall that informs you of where to look. Worn treads are indicated by your tire depth gauge – As a rule, the tread of your tire should be at least 2-3 mm. deep. It would be wise to buy a tread depth gauge to make sure that your tires meet the minimum requirement. Small objects are stuck on the thread – It’s common for little objects to be found on your tire’s tread. If these small objects are found in your tire’s groove, you need to take them out carefully to avoid damage to your tire. However, if you find something that looks like it went through the tire, like nails, keep it in the tire until you get to your garage. If not, you’d most likely have a flat tire. These are just some of the things that you could do to take care of your car tires. These ideas are also helpful when you want to maintain the condition of your car because your car’s tires are an indicator of the overall health of your vehicle. So, what are you waiting for? Check your car’s tires and have safe driving and wonderful travels!